I’m a mummy on the edge. 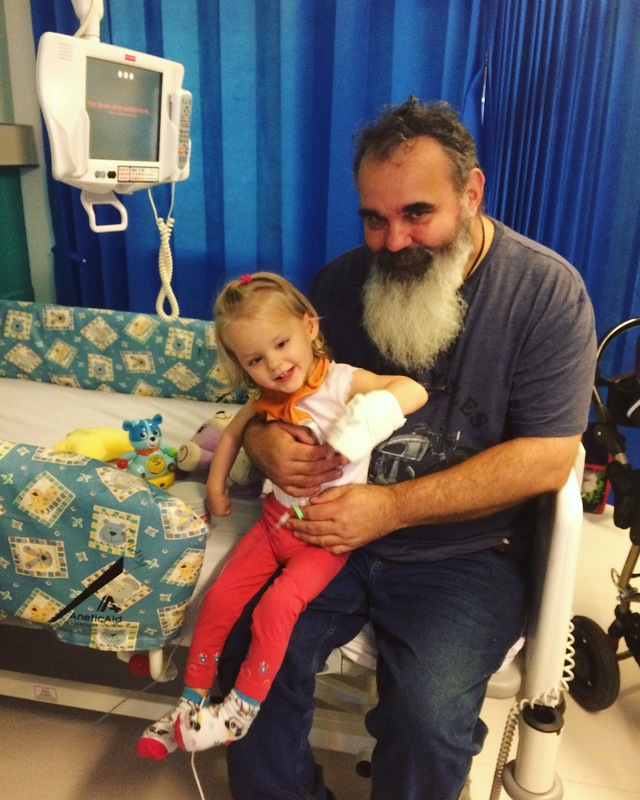 The last few weeks have been a haze of hospital visits and admissions. Our already hectic and unforgiving schedule was blown out of the water. It’s been a steep learning curve once again. I’ve had to face and battle more demons, witness things that I haven’t even begun to process yet and try and hold it together somehow. Violet one day started to flinch slightly when I touched her left ear. I didn’t think too much of it as she didn’t cry and was her normal happy self. The next day I touched her ear to see if it was still sensitive. Violet immeadiately got upset and flinched away from the slightest touch. 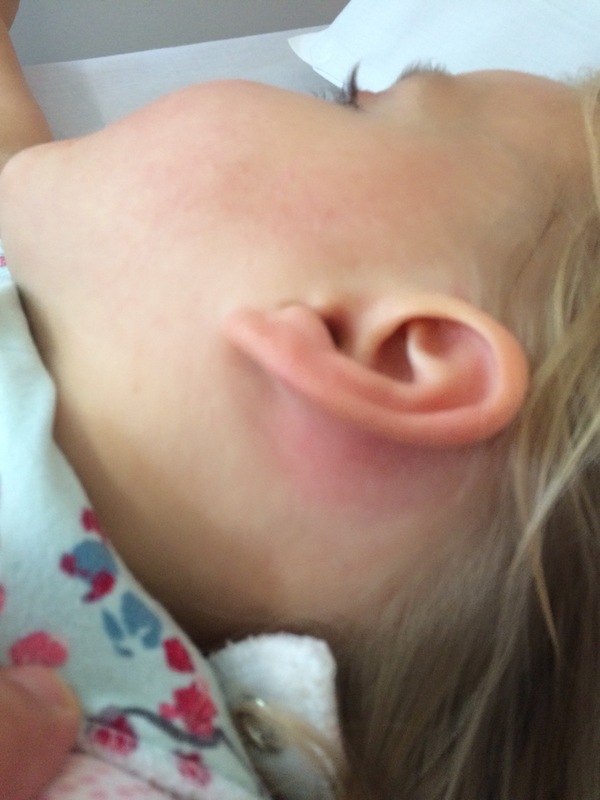 The ear wasn’t red but behind her ear the skin was red and swollen. Having had no experience of children having ear infections I wasn’t sure if that was normal but something told me it wasn’t. I consulted Dr Google, quickly finding mastoiditis. I honestly didn’t think it would be that. I called our local children’s ward and explained the situation, they made arrangements for us to go up and see them for an assessment. Violet is a regular on their books and has open access. I was blown away when they were as concerned as I was. Turns out Dr Google was right, it was mastoiditis. 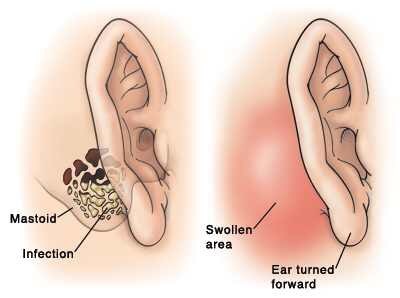 In a nutshell, a nasty middle ear infection that has spread to the mastoid bone of the ear. We stayed in hospital for three days so V could have IV fluids and antibiotics. While there we learned that this infection could have very serious consequences and I am so thankful that Violet responded well to the antibiotics. Having a child with an IV all the time with dystonia is not for the faint hearted. There were 3 cannula changes as they were bent etc. She would wrap the line around her arm in the night. I would get it caught on everything. Sleep was impossible. I became acutely aware how “different” Violet is. She must have had an ear infection for weeks before we became aware of it. Her pain threshold is incredibly high. Not flinching at repeatedly having cannulas fitted, something I personally find very painful. We were discharged home with more antibiotics. Violet was on the mend and we relaxed back into our normal life. Well for a few days. Violet started to get a temperature on the last day of her antibiotics, she also had some redness behind her ear again. This ended as a visit to the ward for review. We were sent home after the doctor was sure the mastoiditis hadn’t returned. That night the fevers continued. In the morning Violet was brighter but still running a temperature. We desperately needed groceries so my family came and sat with V and her brother while I popped out to get supplies and run some quick errands. My first time out in over a week. I was just waiting to pick up some toys for their Christmas presents when I got a call from my husband who had finished work early. He asked me if I had seen Violets rash. She didn’t have a rash, I was so confused. After a baffling conversation, I made my way home while my husband called the children’s ward for advice. They wanted to see her, I got home, packed our bag and off we went back to the hospital again. The rash was everywhere. I couldn’t understand how it had appeared out of nowhere. 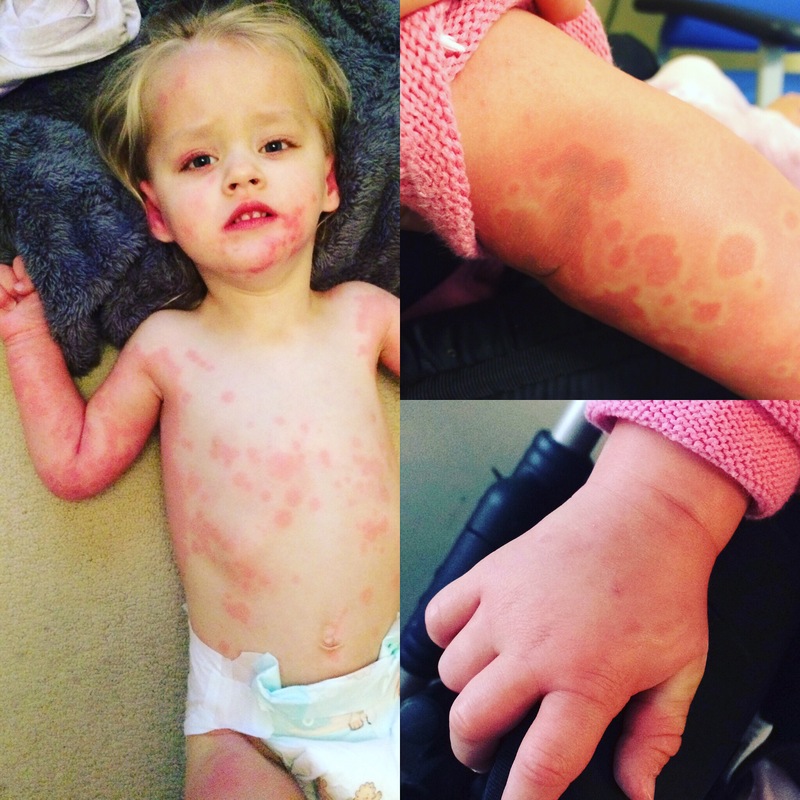 After an examination they diagnosed a viral infection, possible chicken pox. We could stay in for monitoring or go home. I chose home but now wished we had stayed. We got home around six. Violet slept 2hrs that night, ran fevers of over 40, dystonia was the worst I have ever seen it and she was so unsettled and restless. Dystonia for those that are not aware, is involuntary movements. Violet extends her body – head back, almost flinging herself backwards, arms and legs are constantly moving, it’s like trying to hold/restrain a wriggling, squirming, bucking force of nature that is incredibly strong for her age. While avoiding being head butted. It’s exhausting. Beyond exhausted I called the ward and explained that the rash was far worse, her temps, the dystonia, not drinking or eating and that her right arm was swelling. They called us in straight away. We were admitted and given a side room. 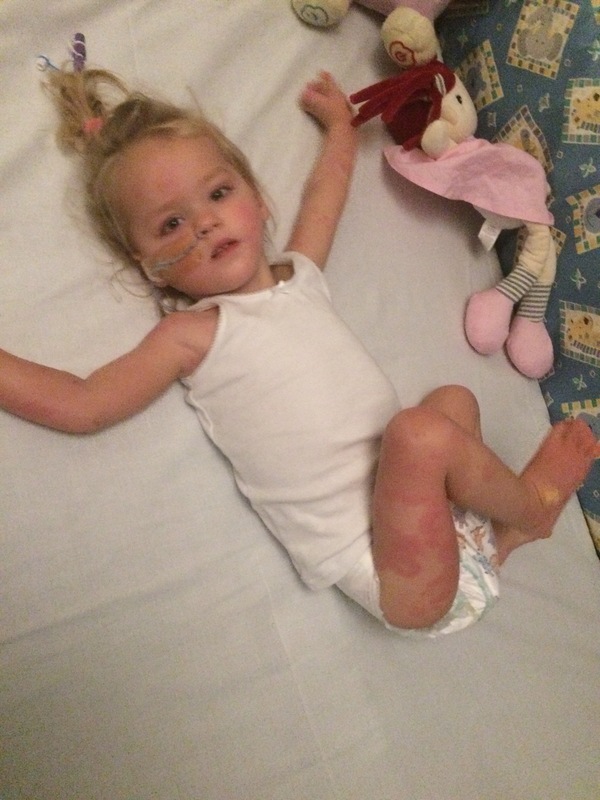 The doctors believed Violet had a viral infection that had progressed to Hives and Erythema multiforme, the swelling was due to oedema. 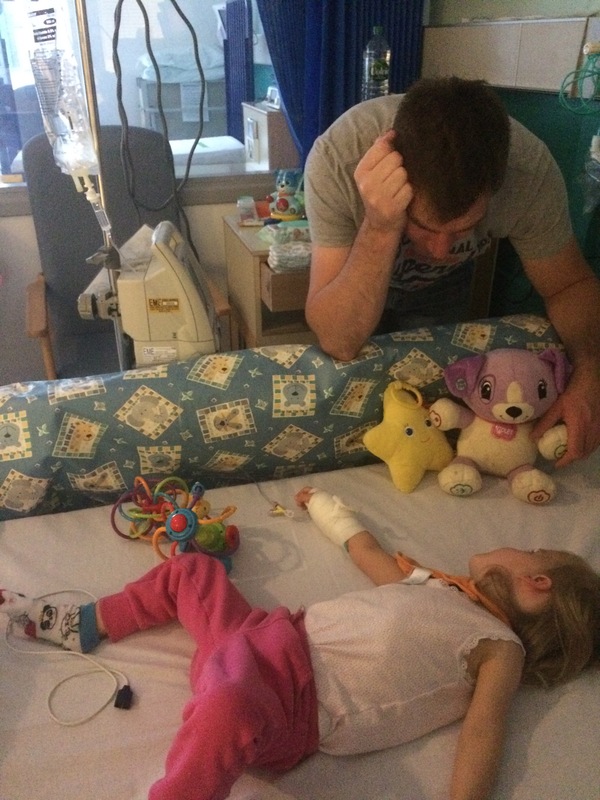 Violet was given an cannula, after 3 attempts in her less swollen hand they resorted to her foot. This was horrific, the screams will haunt me. It was very painful and was in a horrendous position for a child with ridiculously strong legs and who happens to have the worst dystonia of their lives. She kicked that foot/cannula repeatedly against anything and everything. Whenever the nurses had to administer anything through it, it took two or three of us to hold her still enough. That first night was horrific. Temperatures, awful dystonia, the antibiotics via cannula must have hurt as she screamed, the dystonia in her arm was so bad I had to hold it so she could fall asleep. It would not stop moving! I was on my last legs physically, two nights with no sleep and restraining my beautiful girl. My back killed as I was hanging over the bumpers on the side of the bed to hold her arm. My husband took over in the morning as I headed home to sleep. I slept 8hrs solid. Back at the hospital they relayed that V had scared them that morning not long after I had left. The rash going deep red and spreading up her neck. A temperature that paracetamol wouldn’t touch and swelling increasing in her arm. She was started on steroids and after a while these helped. They believed V had also had an allergic reaction to the infections. She was started on antihistamines and steroid cream. She had a throat swab taken and we were told it would take 48hrs for results. Later that day orthopaedic surgeons reviewed V for the first time. Concerned about Vs arm and if the swelling was affecting nerves and vessels. They were confident that although terribly swollen, Vs arm was ok. Feeds were not happening and it was agreed an NG tube would be fitted. That was another horrific moment I wish I could forget. Violet stops taking fluids when she is poorly. She weighs less that 24lbs (average one year old) but expends ridiculous amounts of energy due to her cerebral palsy. Dehydration is a daily risk without illnesses. They were concerned about an IV for fluids as she also needed some sort of food. Hence the NG tube being fitted. NG feeds started at 120mls (4oz) every 3hrs. She hated it. Became distressed and vomited, Violets dystonia meant her arm kept flailing around and would pull her tube, knock the syringe of milk and on occasion knocked the bottle of milk in the nurses hands all over the bed. Tube feeds became another two person job. However in the night with staff shortages this often wasn’t possible. This meant if I wasn’t already awake I would be woken to some sort of chaos. Our usual happy, cuddly, full of smiles little girl was sad, didn’t want to be held or touched, shared no smiles, had no interest in anything and was exhausted but just couldn’t settle. It was heartbreaking. The cannula continued to cause chaos, mainly at night. The bandage was unwound countless times by Violets relentless kicking. One night it was redressed in excess of 10 times. 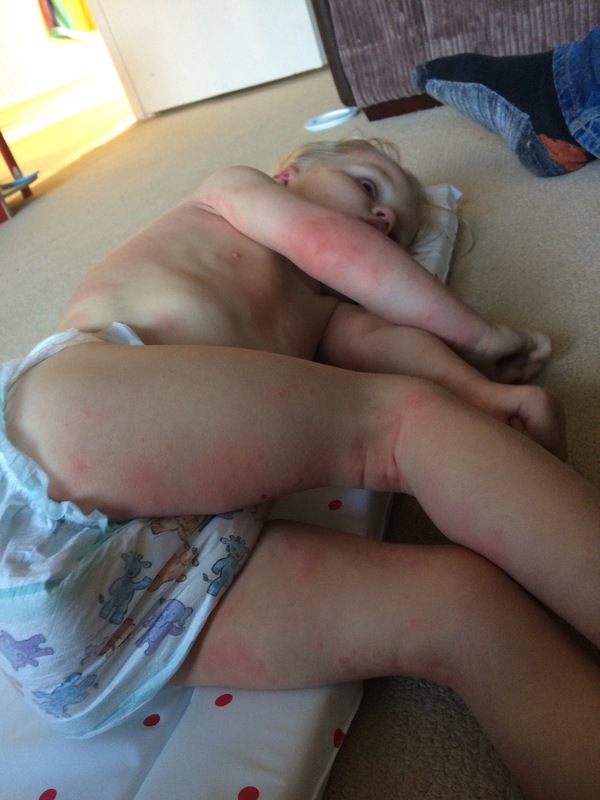 Days went by with little improvements in the rash and swelling but feeds were still bad. So much so that they had changed them to 100ml every 2hrs after the first day. This still wasn’t going well and most were abandoned at 70 or 80ml (less than 3oz). Violet started to gag after a couple of days every feed, often cutting them short or resulting in the most epic vomits. One night we had three of these massive vomits as well as leaking nappies, 5 bedding changes amongst all the other activity going on. There were discussions of Violet coming home with the NG tube, I was against this. Scared that she wouldn’t come off it again. We had avoided tube feeding all this time, she loved her foods and milk when well. Plus she was still not herself, it was too soon. That night sleep evaded me completely. All I could think about was the feeding tube and how we could get Violet back onto oral feeds. I couldn’t see a way. My heart broke. I had never envisaged this happening. A request was made by Violets regular consultant for a urine sample to be collected for testing on organic acids. 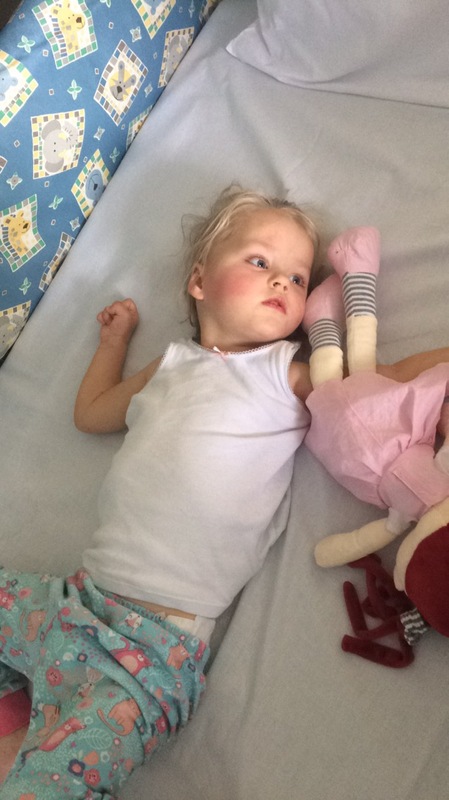 There is a chance that Violets immune system may have been adversely affected by a reaction to to oral antibiotics and in turn caused her to become so unwell. The results take a month but may shed some light. They put these pathetic plastic bags on Vs lady parts to capture a wee, it never ever works. I ended up just sat with V on her bed, stripped her off and waited with a container to capture the wee. After an hrs wait I got it. More bloods were taken to rule out Lyme disease. The throat swab had come back normal so no nasty infection there at least. Violet really started to turn a corner on day 5. She smiled, she giggled, she seemed more settled, even tolerated brief snuggles. The rash now much better as was the swelling. The only thing keeping V in hospital now was feeding. She had developed a massive aversion to bottles and spoons, just the sight of them sent her into hysterics and not the happy kind. The consultant gave us the choice of removing the NG and trying oral feeds without it or to take Violet home with it in. He was concerned that Violets swallow was no longer safe and that the NG may be a longterm thing. I opted to have it removed, despite being scared stiff she would have to have it put back in if our efforts failed. We would try. After a slow start Violet had 10ml then 30ml of milk from her bottle and 8 spoonfuls of an alpro dessert. We were over the moon. So were the consultants and nurses. We were given another choice. 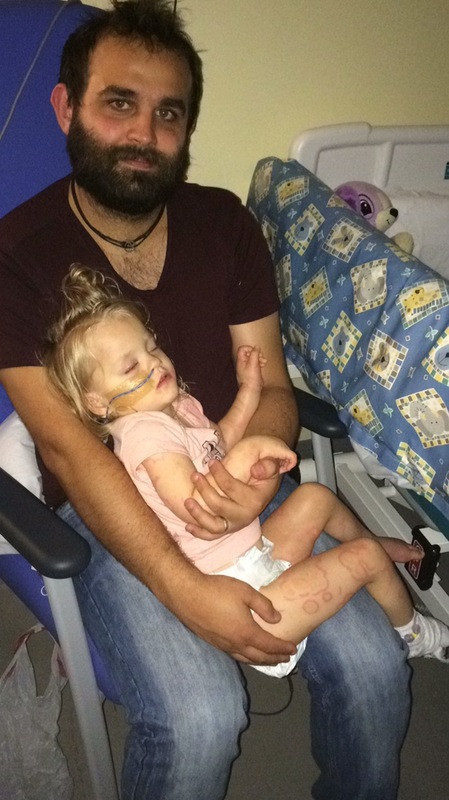 Violet could be discharged home with strict fluid intake monitoring or remain in hospital to be monitored. We jumped at the chance to take our girl home. I knew she would flourish in her own surroundings and with her twin brother there to stroke her head and give her kisses. I was right. Violet went from strength to strength and after only a few days was back up to her normal intake levels. And back to maximum cheekiness. A short spell in hospital for most people, eight days over a two week period. To us it felt like a lifetime. Time is a strange thing in hospitals. Being away from my sweet boy who had croup, my husband and my home. That was tough but the hardest thing without a doubt was seeing my brave girl so poorly and feeling so helpless to make her better. I honestly feel traumatised but in true mummy fashion have swallowed my feelings and carried on, no time to sit and dwell. This approach will bite me on the bum one day soon but until then I will pretend all is ok.